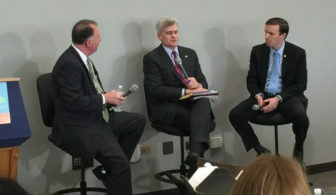 At the mental health summit, Sen. Chris Murphy, right, and co-sponsor Sen. Bill Cassidy of Louisiana, center, speak with Virginia State Sen. Creigh Deeds, whose mentally ill son attacked him before committing suicide. Washington – Sen. Chris Murphy and Republican Sen. Bill Cassidy of Louisiana have bipartisan support for a bill that would reform the nation’s mental health system and are pressing for Senate action on the legislation. But they are facing obstacles common to those who push for change on Capitol Hill: difficulty finding funding and interference from lawmakers who want to alter, in undesired ways, their legislation. The senators held a Capitol Hill summit on Thursday to try to press for a vote on the Mental Health Reform Act, which has already been approved by a key Senate committee. “We know we can get this bill to the floor in June,” said Lauren Alfred, policy and partnership director at Sandy Hook Promise and a supporter of the legislation. At the summit, Alfred and others spoke of problems friends and family members have in securing mental health care. Murphy said he was able to build bipartisan support for his bill “because every single person in the Senate has a story” about the struggles family members have faced in securing mental health care. Currently, the nation’s mental health system has a number of serious problems, including a lack of hospital beds and other types of treatment centers for the mentally ill and insurance regulations that limit and deny care. He said the mentally ill are being held in emergency rooms for days, sometimes weeks, because of a lack of facilities to care for them. “When you hold somebody 30 days in an emergency room, that’s cruel,” Jacoby said. Although mental health advocates turned in more than 200,000 petitions pushing for quick approval of the bill at the summit, the legislation faces some challenges. One is from Sen. John Cornyn, R-Texas, who wants to include his bill concerning guns and mental health in the legislation. Cornyn’s bill aims to avert gun violence by ensuring would-be offenders receive treatment and by enforcing existing criminal laws, rather than creating new restrictions on the sale of firearms. The bill would also clarify which mental health records states must send to the National Instant Criminal Background Check System, a system run by the FBI that screens prospective gun purchasers. It would also encourage state and local governments to provide more records to the NICS system. Under current law, those involuntarily committed to a mental health facility are blocked by the NICS system from purchasing guns. But the Cornyn bill would allow the mentally ill to regain their Second Amendment right to purchase and possess firearms after they are treated, something Murphy and other Democrats oppose. Another hurdle is funding. The bill does not have a funding source, and its sponsors are working with the Finance Committee to find ways to pay for it – probably transfers of money from other programs. Murphy said he had to “set aside” parts of the bill that cost money. One was a provision that focused on removing a Medicaid limitation on the number of mental health and substance abuse beds a hospital can have and still qualify for federal money.